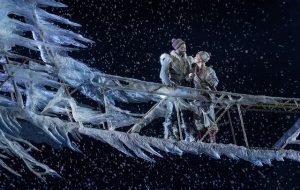 Ten years from now it will be interesting to read how many gazillion persons worldwide have seen the stage musical, “Frozen.” The animated movie was released by Walt Disney Pictures in 2013 and generated $1.3 billion in worldwide box office revenue. It is the highest-grossing animated film of all time. What could be done for an encore? What could a stage version do that the movie could not? For starters, it can provide a visual feast of enormous proportions. Then, the excitement of the audience experiencing a live performance right in front of them cannot be replicated. Based on Hans Christian Andersen’s the Snow Queen,” the basic story remains intact. Two sisters, Anna and Elsa, enjoyed wonderful childhood experiences together. When it was discovered that Elsa had magical powers and could accidently cause injury to her sister, the two are separated for Anna’s protection. Upon the death of their parents, Elsa is to be crowned queen, and her sister Anna attends the coronation as the princess. A dispute at Elsa’s coronation results in her becoming angry with Anna, and she accidentally releases some of her magical powers. The causes temperatures to drop throughout the kingdom, as ice was replacing sunshine. Anna flees from the palace, bewildered by what has happened. Anna’s memories of her happy times with Elsa as a child encourages her to find a way to approach her sister, now ensconced in an ice incrusted palace. Along the way she enlists the help of Kristoff, (an ice deliveryman), his reindeer (Sven), and Olaf, everybody’s favorite snowman. 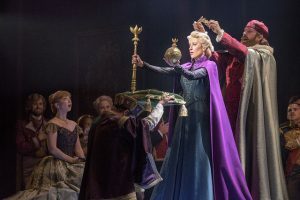 Patti Murin plays Anna, with Caissie Levy as Elsa. 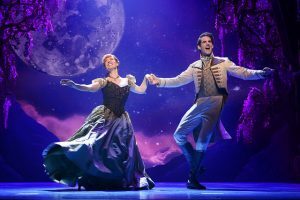 They are both excellent performers, and Elsa’s “Let it Go” is a triumphant conclusion to Act 1. Music and lyrics (for the movie and the stage production) are by Kristen Anderson-Lopez and her husband Robert Lopez, with the book by Jennifer Lee. In the 2014 Academy Awards, the film was honored as Best Animated Feature, and “Let It Go” was given award for Best Song. Enthusiasm for the production in Denver was enormous. Based on obvious audience enjoyment, it will be difficult for theatre-goers to let the show leave Denver to continue its journey to Broadway. The stage at the Buell is impressive, and it will be interesting to see how the enormous sets can be accommodated in other venues. The production is not without problems, and messages are sometimes confusing, and over-powered by the magnificence of the set. It does have all the hallmarks of a Disney production, designed to entertain. The story has been expanded from the movie, and includes substantially more music. Performances are universally excellent. Jelani Alladin is a very helpful Kristoff. 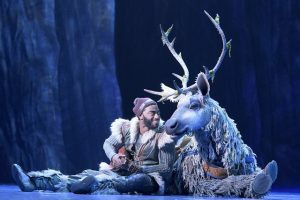 Andrew Pirozzi is a marvel as Sven, the delightful reindeer. 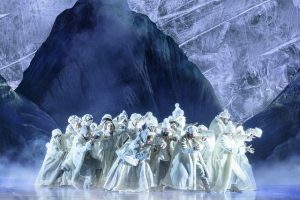 Robert Creighton is in fine form as Weseltoln and Greg Hildreth is a talented charmer as the snowman puppeteer. Previous Post“A Chorus Line” — Better Than Ever!Next PostNothing “Rotten” In This Giddy Delight!